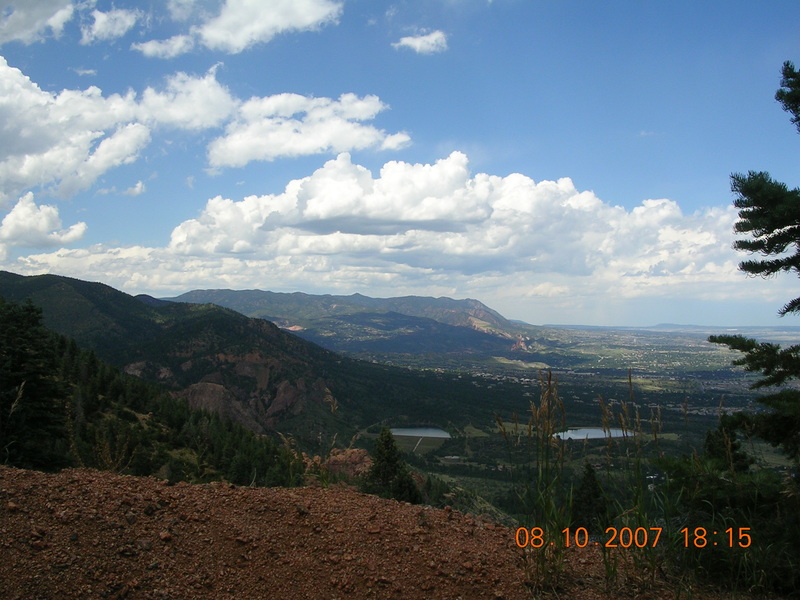 Back in August of 2007, I competed in the Pikes Peak Ascent in Manitou Springs, Colorado. I think it was January of that year when I started training for the event but, I was a classic example of too much, too soon. I trained on a super incline treadmill at the gym which was capable of inclining to 30 degrees. 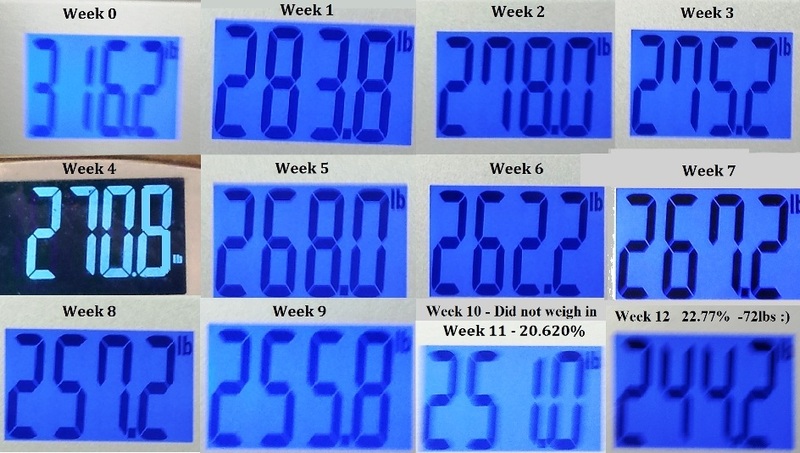 I the span of about 10 days I increased my training on that treadmill from 30 minutes to 60 minutes to 2 hours…. That was too much too soon. I blew out my piriformis muscle to such a degree that, at times, it was difficult to stand without that muscle “catching” and looking back, was most likely irritating my sciatic nerve. Whatever the reason, I was completely knocked out of any kind of training for many months. I had a great job with excellent insurance so, in addition to chiropractic adjustments I was also able to avail myself of physical therapy and a weekly massage for over two months. I really liked those weekly massages! And …I really want to go back to Colorado! The point in bringing up Colorado is to contrast the massive overtraining and subsequent injury I did for that event and the much smarter training I’m doing now. Still, it’s hard to stop musing over the two weeks I spent in Colorado back in 2007, especially looking over all the pictures I took back then. My first day in Colorado was nothing short of amazing and a day I would gladly live over. 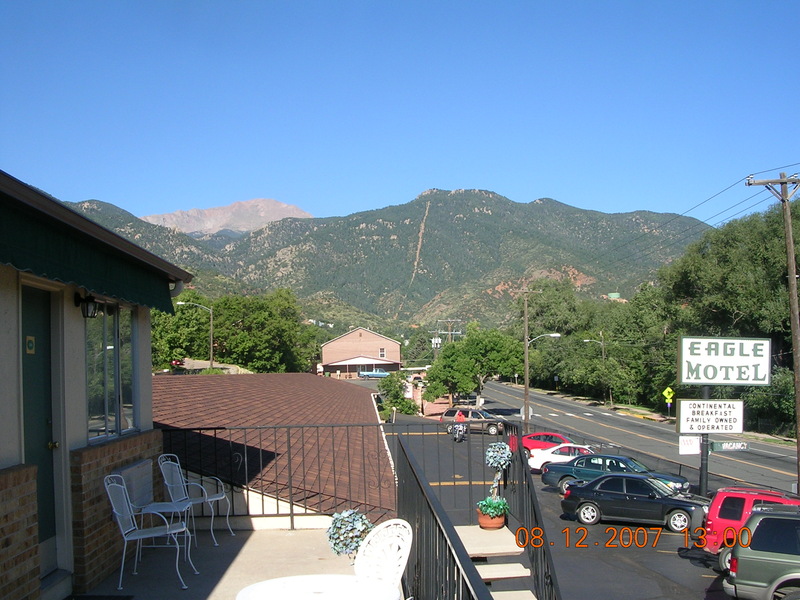 I landed in Colorado Springs early that morning, got my rental car and checked into the first of two different places I would be staying during my time in Colorado. 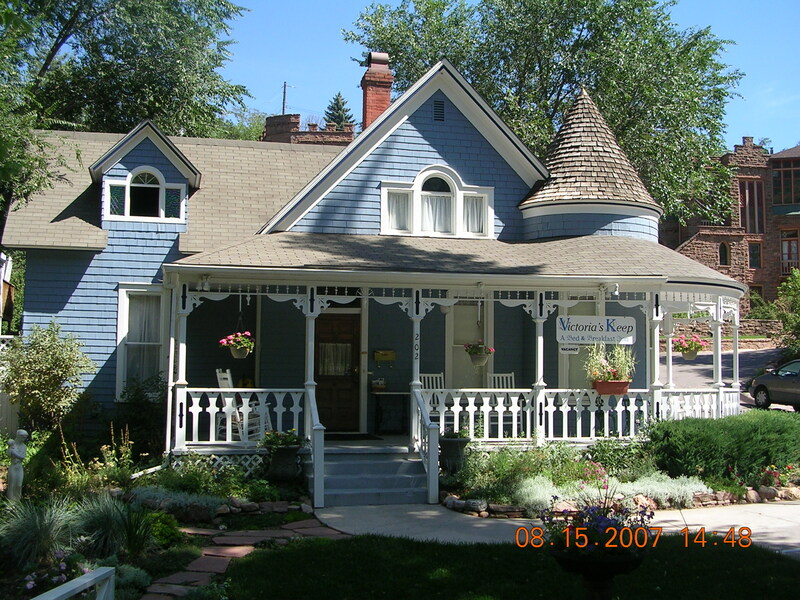 During my first week, I stayed at the Eagle Motel which was about a mile from the Cog Train or base of the mountain, my second week was spent just down the street from the Cog train at an extremely elegant bed & breakfast called Victoria’s Keep. Below are pictures from my view at the first place I stayed and a picture of Victoria’s Keep. I think my entire week’s stay at the Eagle Motel cost less than a single night at that bed & breakfast. Here’s what’s kind of freaky about Colorado. 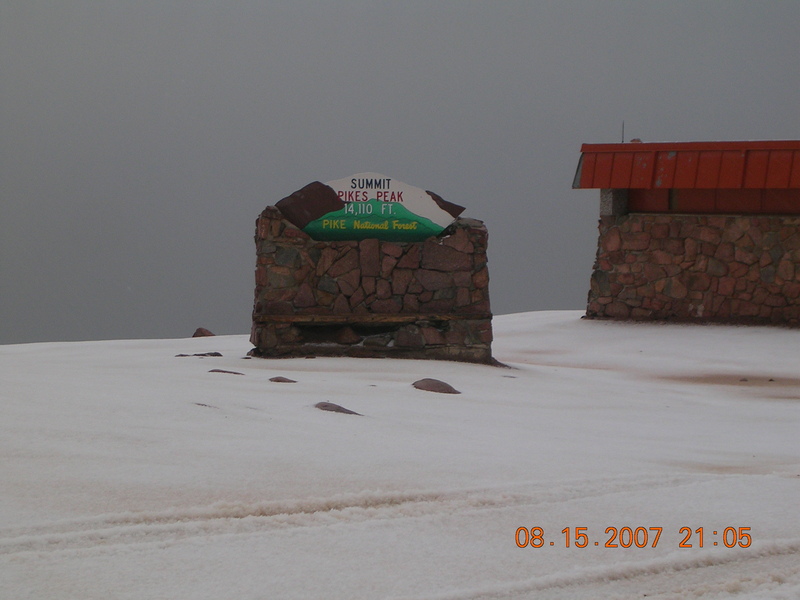 On the same day I took that sunny picture of Victoria’s Keep I drove to the top of Pikes Peak (which I did about 10 times) to help acclimate myself to the lower oxygen concentrations but, there was a freak snow storm at the top of the mountain that day and the park rangers ended up closing the mountain so we all had to drive back down. 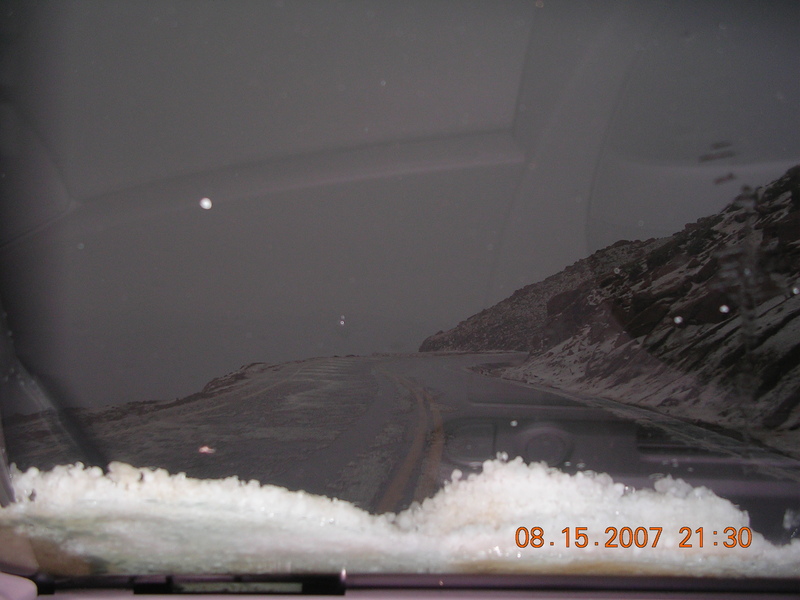 Below are pics from later that day, at the top of the mountain and a view out my windshield as I was driving back down the mountain. 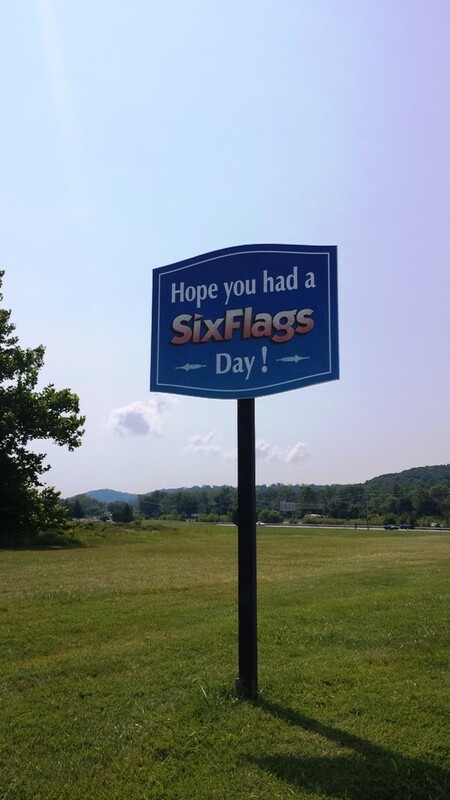 Within minutes after checking into my first hotel, I headed off to the mountain! 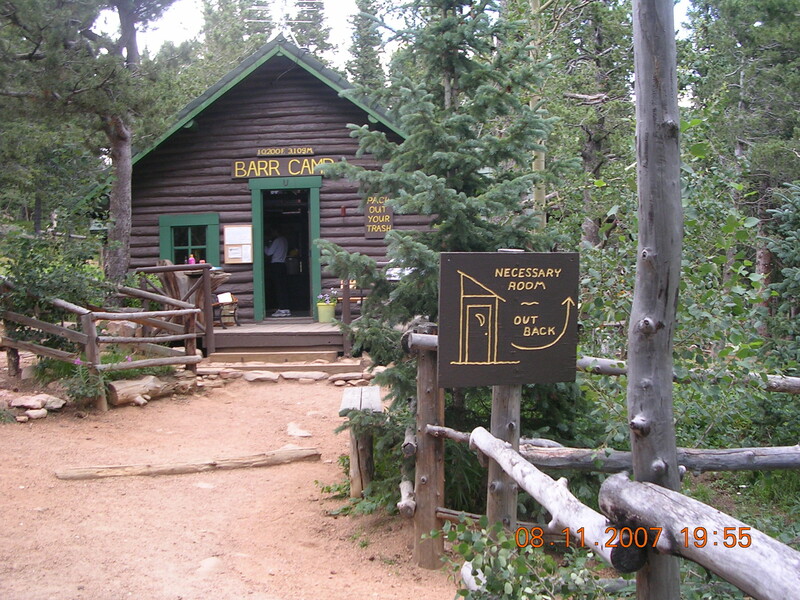 I stopped at the Cog Train depot and bought a one way ticket DOWN the mountain then headed up the mountain to Barr Camp which is located about 7 miles up the mountain. I bought some M&M’s and a drink at the Barr Camp store, took some extra trash with me from the store (because there is no trash service at the middle of the mountain) then shot laterally across the mountain to hook up with the Cog Train on it’s way back down from the top of the mountain. 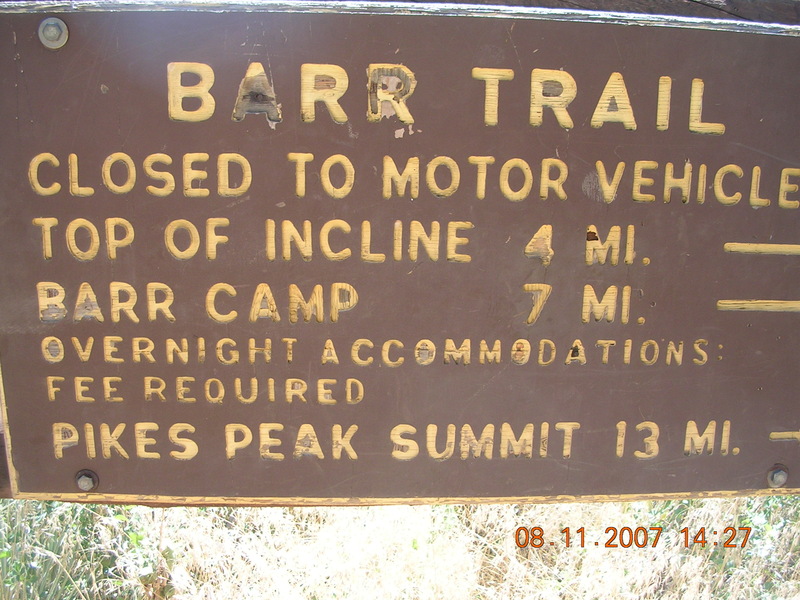 Anyway, after Barr Camp, I shot over 1.5 miles to meet up with the Cog Train on the way back down and met a great couple from Denver who were visiting the Peak area for a few days. 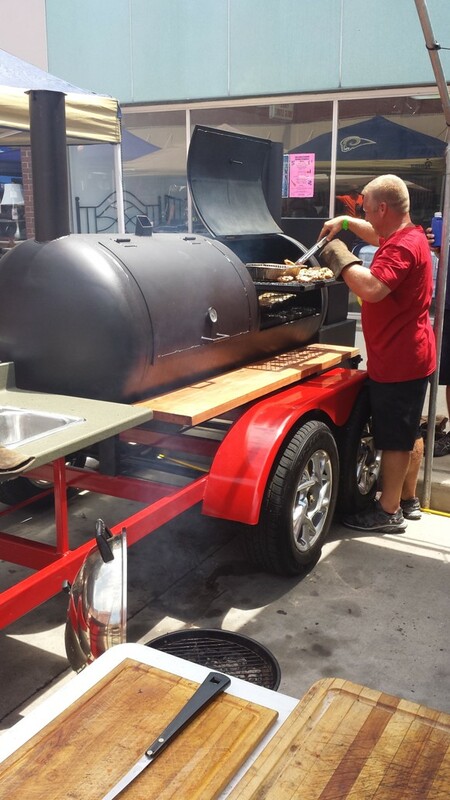 We all ended up going to the Cheyenne Mountain Zoo, had steak that evening at the Stagecoach Inn and partied it up at pretty much every local pub in the area. After that couple left, I had moved to the Victoria’s Keep B&B where I met up with the 180 Energy Running Team from Anheuser Busch and spent the rest of the vacation with them. There’s so many pictures I’d love to share from the zoo, to the mountain, 180, Will Rogers Shrine of the Sun, and a host of other places & people but, my Internet connection here seems to be a little quirky today so I’ll have to save that for another time. I did run across some videos I took while on the mountain and, in particular, from my first hike up to Barr Camp then over to the Cog Train. Per those videos I learned it was 2 miles to the Cog Train from my hotel, then 7.5 miles up to Barr Camp then another 1.5 miles across the mountain to hook up with the train. Also, due to the busy time of the year, I had to purchase a round trip train ticket to ensure I would have a spot when the train headed back down the mountain. All I can say is …I want MORE! 🙂 More please. More of the same. More of the really good times. When I look back over those pictures a really cool part of it is that in less than two weeks after Colorado, I have another folder for the time I spent at Virginia Beach and that trip pretty much rocked as well. Even though I was injured while training for the Pikes Peak Ascent, I still went and had a great time but it took me a little over 9 hours on race day to get to the top of the mountain and, that is quite a story in itself. The cutoff is 6 hours to make it to the top. Race officials tried turning me back at Barr Camp on the day of the race because my pace was a little bit off of what was needed to make it to the top in 6 hours but, they said they wouldn’t stop me if I continued, so I pressed on. At A-Frame, another stop about 1/2 way between Barr Camp and the summit everyone in the race was being turned back due to not making the necessary pace. A-Frame is about 10,000 ft up and about 3 miles or so from the summit. I just didn’t want to turn back so I tore off my racing bib and my racing bracelet and pretended I was just a hiker so I could get past the race officials at the A-Frame checkpoint. The plus side of things was that I could continue on my journey to the top of the mountain. The down side was that I had to give up a few things like the remaining water stops along the way to the top since they had already closed down. I also had to give up my ride back down to the base of the mountain but figured …well, I just figured I’d be OK and could end up meeting someone who would give me a ride back down which, is exactly what ended up happening. I did get lost and ended up in part of the tundra where grass grows about an inch or so every 100 years and there were stories circulating of a Bear spotted in the vicinity of Barr Camp. Anyway ….this is a good program I’m on now. I sort of skirted around my first few legitimate long runs. I did my 7 mile long run a few weeks back at the Lake of the Ozarks but my 8 mile long run the following week was substituted with the 34 mile Tour de Donut. The 10 mile run the following week was substituted with the Biggest Loser 10k at Six Flags but, there was no getting around things this past weekend and my original plans were to meet with some group called the Walking Ramblers who were going to do a five mile loop around Babler State Park and I figured I could do that loop twice like some of them were going to do then tack on an extra mile at the end to make my full 11 miles of training for that day. I had to work late the night before and didn’t have it in me to get up as early as was necessary to get to the park by 7 a.m. (it was about an hour away) but, I did eventually make it to the prescribed starting destination and headed off on my 11 mile journey. Miles 2 to 4 were all uphill and from my Sports Tracker, I could tell there was an elevation gain of about 350 feet for those two miles. 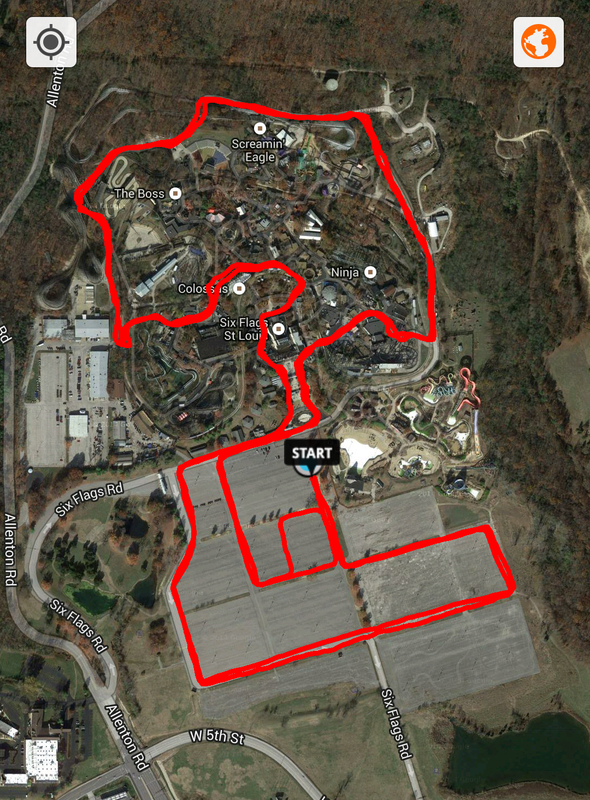 My 7 mile jaunt at the Ozarks was hilly as well and I was able to compare the two runs. My average pace at the Ozarks was 17:41 and my average pace for my 11 mile hilly run was 15:50! 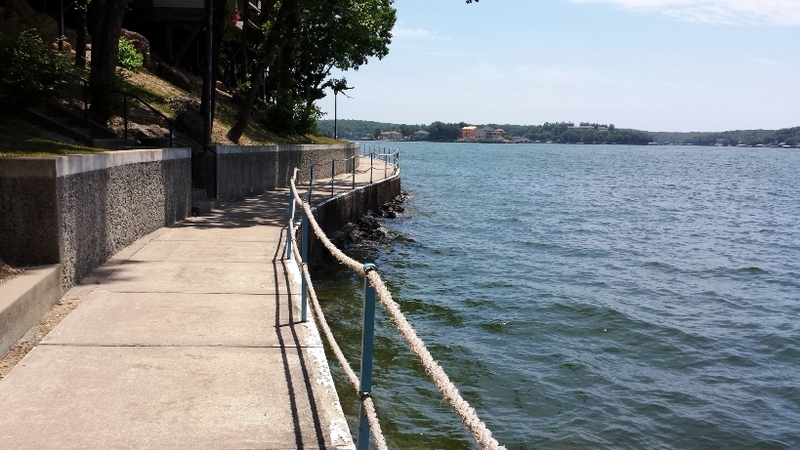 I could really tell I was much, much stronger at Babler State Park for my 11 mile run. 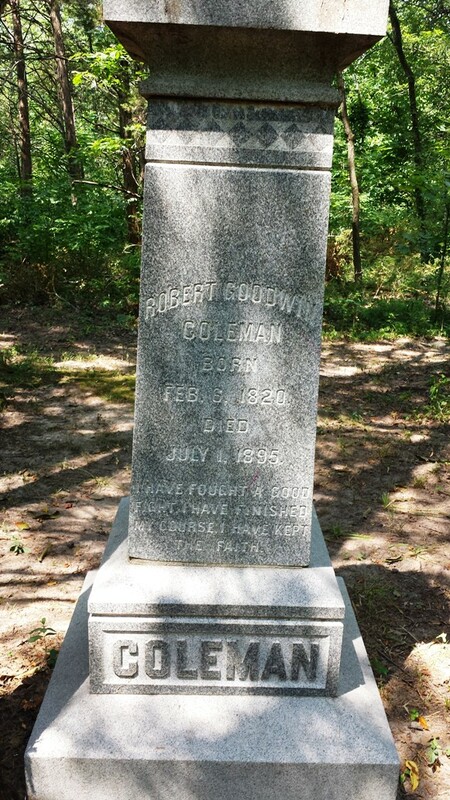 One of the things at Babler Park that reminded me of Colorado was a cemetery I came upon during the first part of my run. 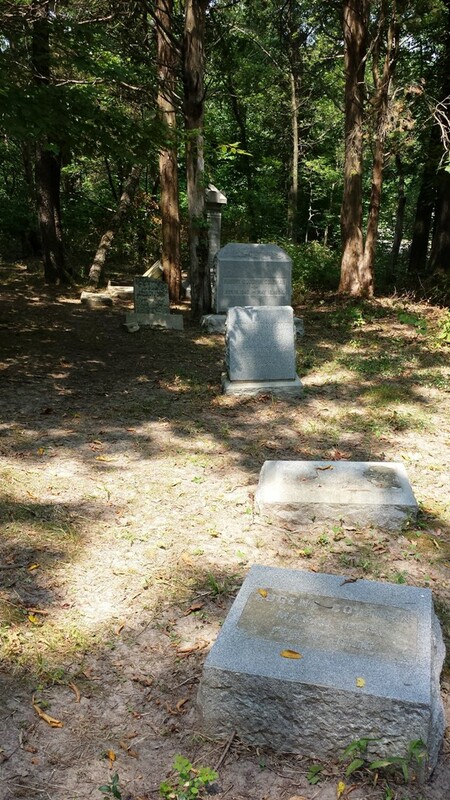 The first picture is a grave of someone who died in 1895 and the gravestone to the right is off a little guy who lived less than 3 years and died in 1865. In between those two times is a lady by the name of G. Inestine B Roberts who was born in 1869. Talk about feisty – this lady was all of 5 feet tall and weighed 89 pounds. 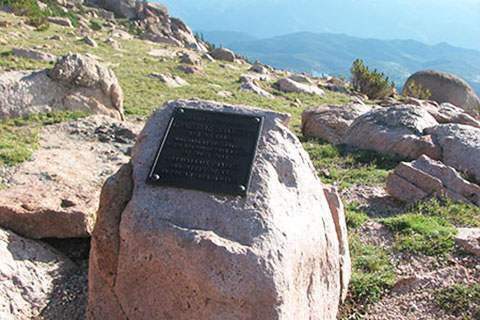 This lady made 14 Ascents to the top of Pikes Peak and about 9.4 miles from the trailhead of Pikes Peak is a memorial to this amazing lady who died on the mountain during her way back down from her 14th Ascent. 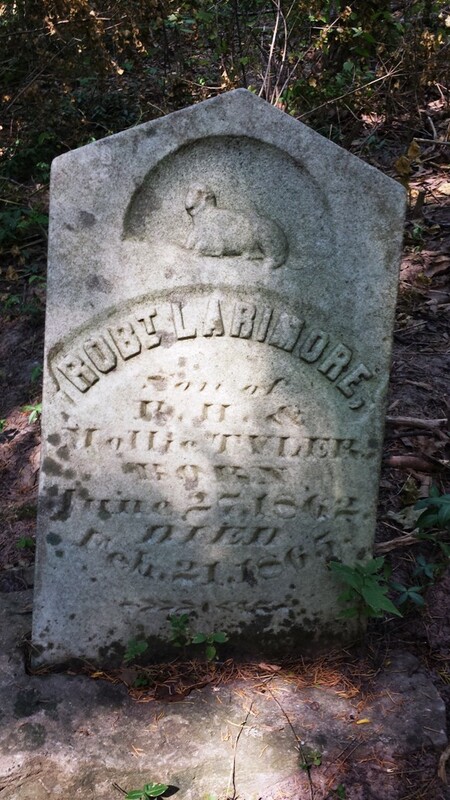 I came up on this lady’s memorial during my 9 hour trek to the top of the mountain during my own personal first ascent. 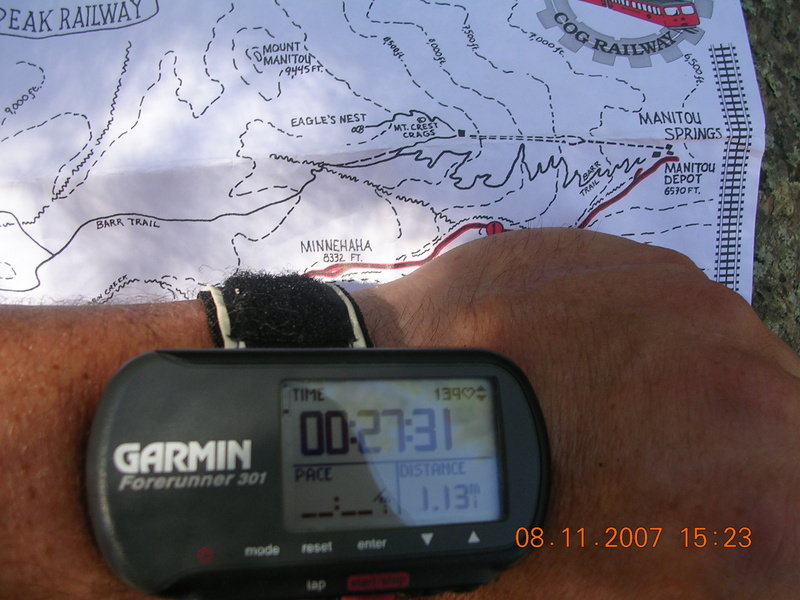 After I gave up all the safety and security of being watched after from the Pikes Peak race officials, I was in pure survival mode while in pursuit of the summit. 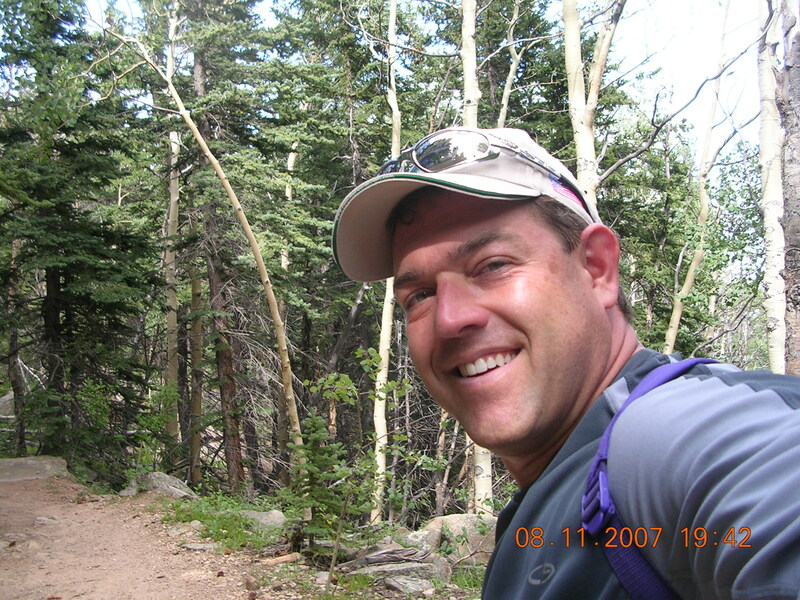 Death is kind of an option one needs to be aware of while hiking up to the top of Pikes Peak on their own. I vividly remember stopping at Inestine’s memorial and placing my hand on her memorial and praying a bit for safe passage to the top of the mountain. Anyway – Week 16 was a very, very good week and a very solid week of training. I can tell I’m getting stronger. Many years ago, I first had a notion of training by running a half marathon distance every weekend because that distance seemed to profoundly affect me in a very positive way. I suppose I wasn’t too smart back then because I never built up my training miles to adequately complete that distance every weekend but – from this point on, from my 11 mile training run forward and for about the next 14 weeks, that is exactly what I’ll be doing for my long runs – i.e., completing a half marathon distance or better every weekend. I’m perceiving these efforts as being in the realm of life changing. I felt fantastic after the 11 miles. Some basic sore feet and fatigued leg muscles but nothing to incapacitate me as has been the case in times gone by when I’ve completed similar distances. I liked the fact that I didn’t need a crowd of spectators in order to finish this distance as is the case when running a half marathon. Sort of like, pure internal strength. Even 9.75 miles into the run I was still able to pick up and jog. I better save the rest of my life’s ponderings for later. This is Week 17, Day 1 and I still have a 4 mile run to get in before the night is over. Somehow, someway, I’ve improved and gotten stronger. That last 10k I did had me out and very sore for 2 days which is why I did my three preceding runs before my long run last week on three consecutive days – Tue, Wed & Thur and those were runs of 4, 5 and 4 miles respectively. But, I had no problems with any of those runs and the 11 miles I just did was easier than the 6.2 miles I did the week before. I’ve learned a lot – For me, jogging is slow but a somewhat tight range of speeds, something like 4.1 to 4.4 mph and seldom above or below that range for any length of time. With walking, I can go as fast as 5.0 mph and keep it up for a fair amount of time but the bottom part of my walking range is much slower, I’d say my walking range is 2.5 to 5.0 mph. If I’m focused and in the moment, I can keep up that 5.0 mph walking pace but, it takes a some determination and effort. There was one point in the 10k where I found myself alone and when I pulled my smartphone out of my pocket I saw that my pace had slipped to 4.0 mph or a little below so I had to pick up the pace. There were points in this race however, when my jogging pace was starting to match my fastest walking pace. (i.e., 12 min/mile or 5 mph) This occurred when I was walking at max pace then my jogging form started to take over. 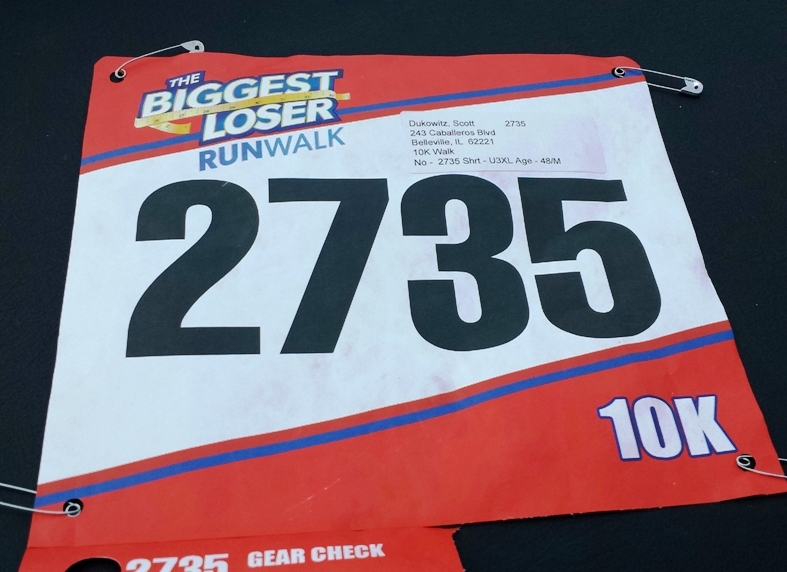 Maximal Effort – During my practice 10k this past week my fastest mile was 12:58 but during this Biggest Loser 10k – EVERY mile was FASTER than 12:58. I was cruising! For me, maximal effort means I’ve got nothing left at the end of the race and it’s been like that for my last 3 races. There is no massive sprint at the end because I don’t have anything left inside me. I pick up the pace for as long as I can and for as fast as I can. For short term jogging/running, I can easily exceed that 4.1-4.4 mph pace and easily push 6.0 mph but, it’s not a pace I can keep up for any great distance. This last push I gave today lasted close to the final 1/2 mile which is pretty huge for me. I could tell my legs were wobbling which reminded me of my 1/2 marathon finish in Manitoba, Canada. Being a Target! – I know how this works, you pick someone ahead of you that you would like to catch up with. There were a lot of run/walkers in my particular group of runners and they would all jog to catch up with me and pass me a bit then drop back down to a walk. Around miles 4-5 some of them got ahead of me but, it’s important to run your own race which is exactly what I did. I could see my times, I could see I was often in a 12 min/mile range or faster already and had to accept that because I’m not yet a 10 min per mile runner or anything. I had a target I picked in the first mile or two of the race. They had an easily recognizable outfit, thinking it was solid black and red and I noticed they were alternating between walking and jogging but, I never was able to catch them. At the end of the race, I knew anyone faster than me was already done which was part of the reason I was confident I could stay ahead of all the other people who had been using me as a target. Mental Anguish Remembered! 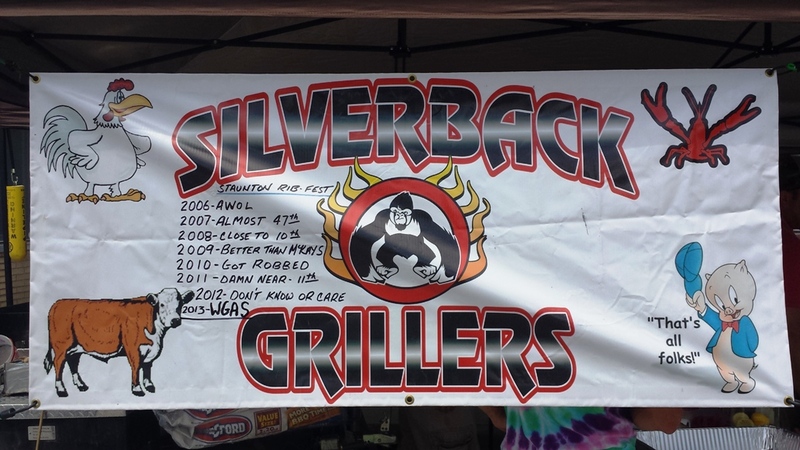 – It was April 29th, 2007 at the St Louis Science Fair 10k …. There was a 5k option but, I was stupid and signed up for the 10k. I remember the split when people doing the 5k went one way and the other 132 people who were doing the 10k went a different direction…. Ugh! I know there were 132 people because as soon as we made that 5k/10k decision turn 132nd was the place I found myself in. Unless ….I could catch up to my target! My Target was a 66 year old female who just kept right on trucking ….she was walking and I was anemically jogging as best I could interspersed with walking. It took about the entire 6 miles to catch up to her and finally pass her but, I did it…. and secured the lofty place of being 131st out of 132nd. I hated that extra 3.1 miles. 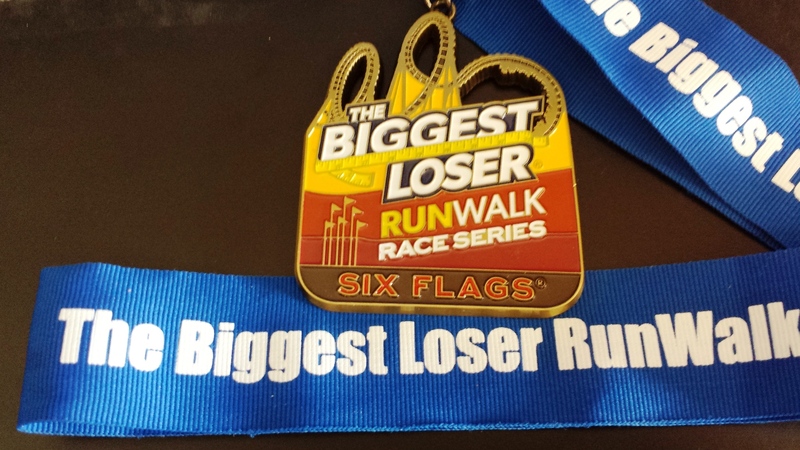 It’s something that never left my brain and I knew this Biggest Loser 10k was going to be like that. 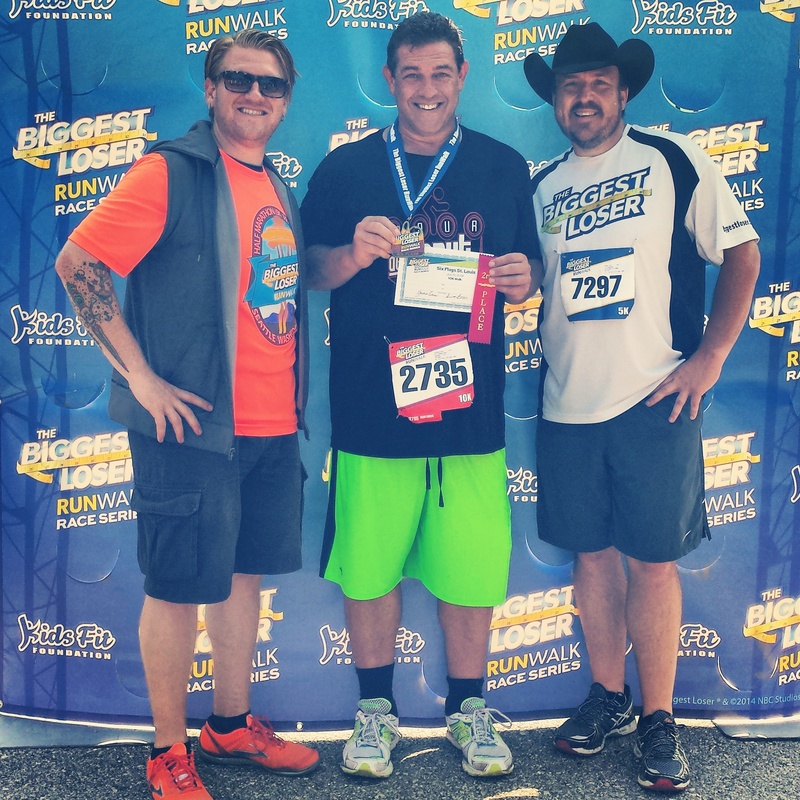 Had I chosen the 5k option then ….I could have ran an extra 50 yards at the 5k/10k split and been done with the race. I didn’t know if I would end up hating myself and regretting my choice. Fortunately, since I have been training for the last 15 weeks, it wasn’t that bad and things turned out alright. I did compare my 5k split time and found that I would have taken 3rd overall out of 140 people in the 5k walking division. 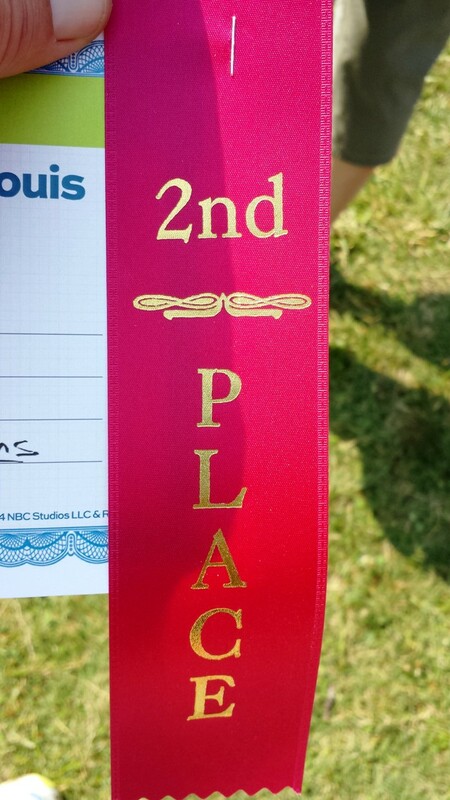 Some lady who cranked out an 8:21 pace won the overall spot but, 8:21 hardly qualifies as being a walker so I’m thinking Kellie Kelly from Ferguson MO was probably on drugs when she picked the walking division or, maybe she just made a mistake. Had I Done the 5K Walking Division – Looking at my 5k split – I would have placed first in my age group and 3rd overall out of 140+ people 🙂 I needed the longer distance to go with my marathon training program and figured I’d still have a fighting chance of getting some sort of award for being in the top 3. I’m still trying to figure out exactly why competition makes such a big difference. At first, I thought maybe it was for the kudos, having other people see and be aware of my progress would make a difference which is part of the reason I was posting my weekly weigh-ins on this blog but, that hasn’t made any difference at all. So, it’s not the kudos or the accolades and there’s something more to the improvements one makes which is inherent with competition. Even my running in competition is far superior than the times I put up for my training. Especially in the last two months, my training times have been kind of flat and overall don’t represent much in the way of improvements which is like the current picture of my weekly weigh-ins, it’s pretty much flat. One area where I tend to console myself is in the fact that I had tried the Lose to Win contest a total of 5 times during the preceding years. The first two times I did the contest in the Fall I placed 4th and 3rd respectively which, is pretty good considering the contest is comprised of over 1,000 people and those first contest had the men and women combined for an overall top 10 whereas the current contest break things up into the top 5 men and top 5 women. Two other times I tried the contest in the Spring and failed to finish either one. The second picture above represents my 5th attempt, also in the Spring and the 72 lb, 22.77% loss was good enough to give me first place. The one difference I was able to note between the Spring failures and Fall successes before this last attempt was in the fact that I had clinic in school for both of the Spring attempts and no clinic in the Fall attempts. During this last attempt, I had already graduated 🙂 so there was no clinic. I was reading some works by Nikolai Berdyaev who said that living the good life is frequently dull and flat and commonplace. There are so many different places that line takes me in my head, so many tangents, that it’s hard to coalesce those thoughts into something coherent and I know that initially writing about any one tangent is going to branch off into many other tangents which may or may not support or have anything directly associated with any original thoughts. Drama Queens – I use the phrase drama queens somewhat like the usage of mankind which doesn’t necessarily refer only to men but to all people, likewise I know there are both genders which may tweak the realities of life in their own heads in order to add a bit of texture and excitement to their own commonplace lives. or the fantasy of tomorrow. Nikolai claimed that the greatest problem people have to the otherwise dull, flat and commonplace life which necessitates a good life is to make it fiery and creative and capable of spiritual struggle which, is where my head linked one genesis for where drama queens come from. For those inclined people, it’s a palpable & desired threat (whether consciously or unconsciously motivated) to the commonplace which will suddenly and for all time intensify it’s value. It’s a very easily obtained divergence from the common, flat, dull life. Going to the park and running is almost always good & fun once I get there. It’s the thoughts in the head before hand which may sometimes tell myself it’s dull, flat and commonplace. In my most recent Instagram post, I likened our runs to adding a sheets of paper to a stack, each run adds another sheet but, stack up enough and we can eventually reach the moon. I tend to think also that giving ourselves adequate rest from our runs can be like adding two sheets of paper since that is when our bodies adapt to the stresses we place upon them from training. In another book I was reading there is mention that “Given the choice, most of us would give up the reality of today for the memory of yesterday or the fantasy of tomorrow. We desire to live anywhere but in the present.” This lends itself to the somewhat ephemeral notion of living in the present, the here and now. As an athlete and especially when we are pushing for greater performances we necessarily force ourselves into living in the reality of the present. And maybe ….just maybe, that is a reason why competition forces us to perform better than normal because we are forced to be even more focused on the task at hand. Reality and being realistic offer a dichotomy of thoughts as well. There is a pending Instagram post I’ll put up sometime soon which I gleaned from watching videos on YouTube. Ironically enough, I was watching videos on polyglots, which are people who know several languages. There was one inspirational video of a man who learned a fluent level of Chinese in three months time. 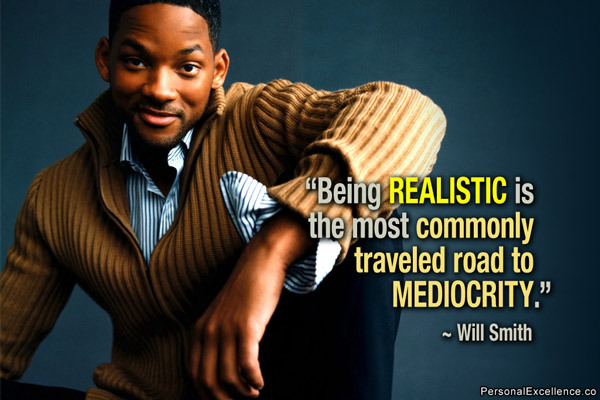 The dedication was impressive and at one point in the video he mentioned a quote from Will Smith who said, “Being realistic is the most commonly traveled road to mediocrity.” I tend to agree with this line of thinking. I recall back in high school when I first got involved with karate at the age of 15 and some friends said they didn’t think they could do that and when I think of doing something, I just get involved and do it. The dichotomy comes into play when you realize not being realistic involves thinking about the future, i.e., where you want to be and what you want to become at some future date when facets of life such as happiness would be linked to living in the present. There was an article I read in Psychology Today which was about two approaches to relationships. One approach was a Maximizer approach in which a person was continually on the lookout for something better and the other approach was the Satisfier in which a person had a short list of “must haves” in a partner then, once they found someone that satisfied that list, would be content with that relationship then go about working on and improving themselves (as opposed to trying to change the other person). The results of the study indicated the Satisfiers were happier while the Maximizers tended to compare themselves a lot with other people and were prone to depression. With these two different approaches it seems clear that the Maximizer is someone living in the fantasy of the future while the Satisfier is living more in the present. But, we could also say the Satisfier is being more realistic than the Maximizer which opens up a new train of thought on differentiation. ….I’m not sure where the impetus of this train of thought was originally meant to accomplish … (scrolling up) oh yeah – Philosophy of Achievement. If nothing else, I think I have an insight into the benefit of competition in that it forces one to be most present in current time from which best performance may be achieved. 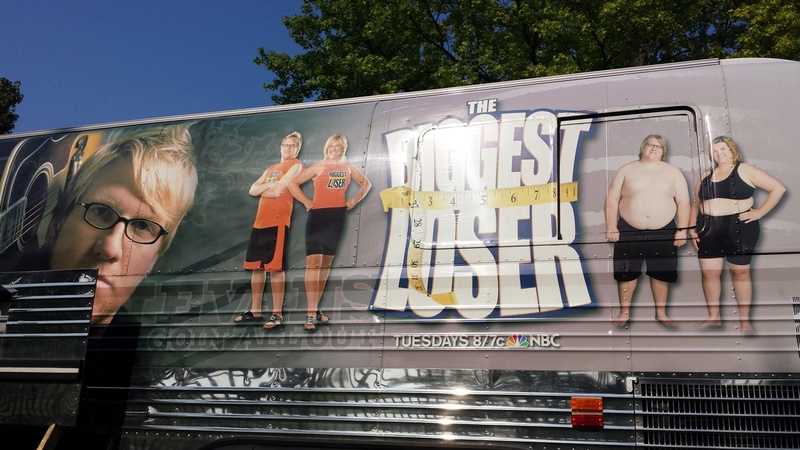 Which reminds me of the Biggest Loser 10k coming up in a few days. I went back and forth between signing up for the 5k or 10k in this run. Both of the divisions offer a walking or running option and having seen the completion times for the 5k’s in the walking division for other races around the country I knew there was a decent chance of being able to finish in the top 3 and getting an extra medal or award which would definitely be a first for me. Ethically, there would be an ironic conundrum because I am capable of running an entire 5k however, I can walk faster than I can run/jog which, is the ironic part. I finally decided on the 10k because that hasn’t been a distance I have been able to run completely yet which justifies the walking division and, my scheduled training run for that day is 10 miles so the 10k would at least give me 6.2 miles of the 10 miles needed for that day. A big reason for signing up for this recent plethora of runs was to get help from being with other people to get through the mind boggling distances I’m supposed to be covering in my marathon training program. Here’s something really ironic. For my Week 15, Day 1 run, I did a 10k to see how I could handle it. I must have jogged the first 5 miles or so but my fastest miles were at the end of the run and my very fastest mile was mile #6 which is when I finally started walking! In fact, that last mile when I was walking was over a minute faster than any previous mile! 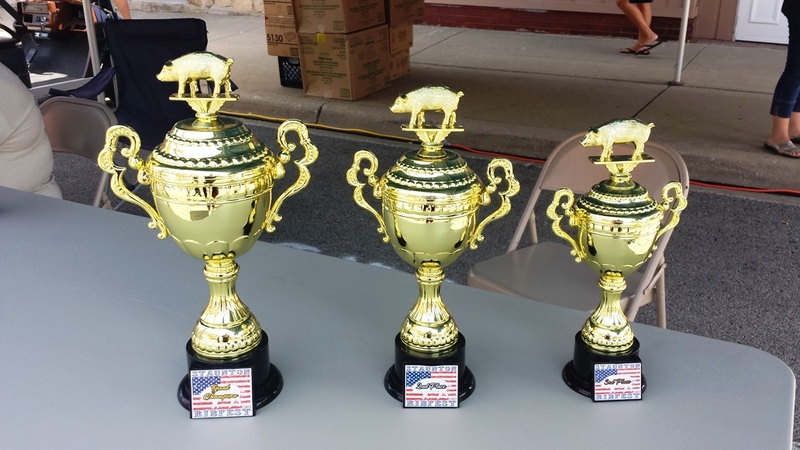 <—Click Pic for Race Results! My official adjusted time was 2:41:35 which corresponds well with my Sports Tracker time of 2:45 and, for the most part, my Sports Tracker app time was supposed to pause during my stops. 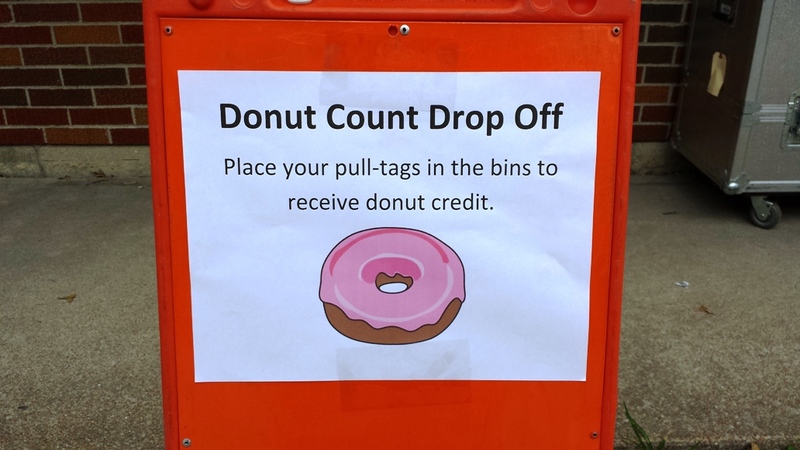 So, it looks like the 5 minutes I saved per donut eaten was offset by the same amount of time I spent at each stop but, this was something new for me and being competitive wasn’t on my agenda. The latest addition to my playlist has been great and I’ve been listening to it often. Few adjustments will need to be made. I’ve got some harder rock type songs I want to add by such bands as AC/DC and Nazareth which I’m thinking could be useful for the later miles of the marathon. There are various reasons for liking a piece of music. A lot of what I have on my list could qualify for simplistic, bubblegum, pop music types of songs that have a good rhythm and can help keep my cadence up and moving but, others have deeper meaning. One song I’ll be adding is Adele’s song, Someone Like You, sung by Andrew Wishart who was a 40 year old contestant on Australia’s version of the X-Factor. This man has four children and from his interview I’ve gleaned or imagined in my head that one of the main reasons he performed is to teach his children, not unlike Randy Pausch who gave “The Last Lecture” and whose intent was to make it for his children. I have Randy’s book and have seen his video of the Last Lecture on YouTube. I think the impetus to do these things for their children is remarkably outstanding and among the most worthwhile things a person can do with their lives. 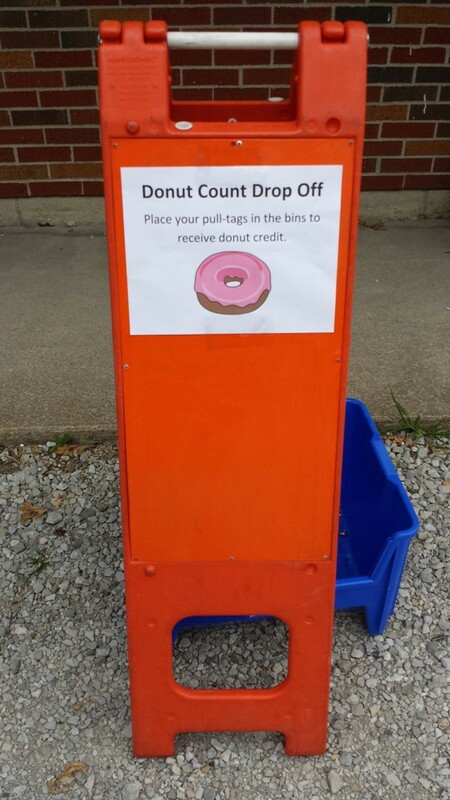 W14D4 – Tour de Donut! 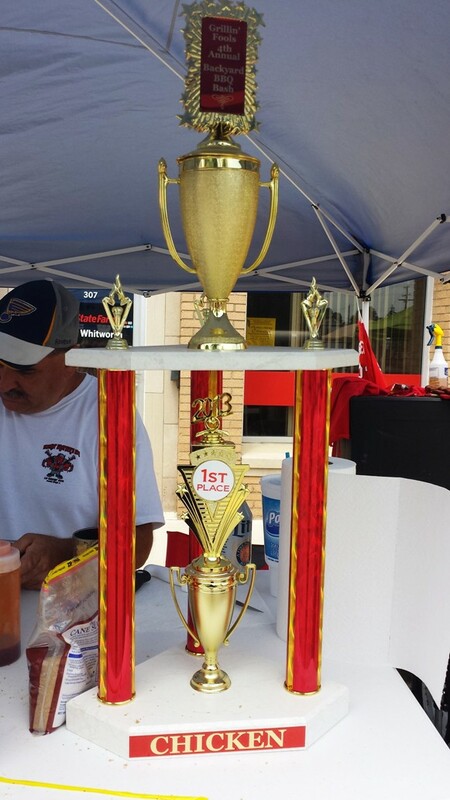 The Tour de Donut held this past Saturday, July 12 in Staunton, Illinois was one of the funnest races I’ve ever participated in. 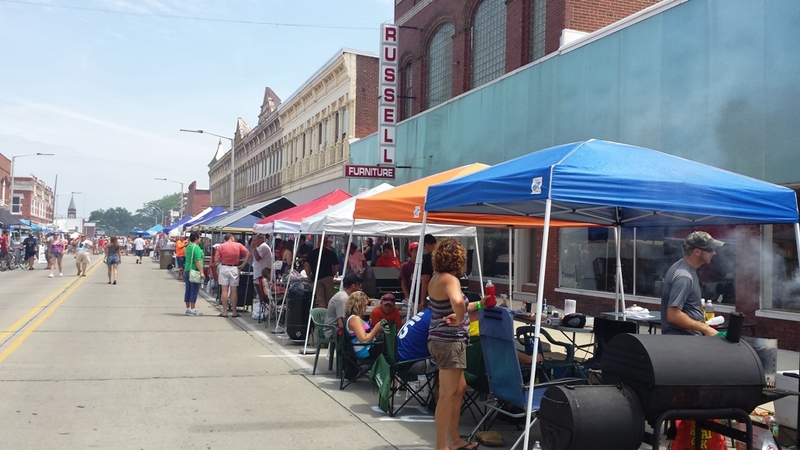 I was really excited about this race and felt like a kid on Christmas morning when the race first started out and we rode through the main street in Staunton where the ribfest was taking place that day and thousands of people lined the streets to cheer everyone on. Shortly after getting out of town we encountered a couple short, steep hills and the first minor accident I witnessed when a car was coming towards us and everyone had to slam on our brakes right after speeding down the hill. One young lady lost it and fell off her bike. I wasn’t able to pedal fast enough to downshift to an easier gear and had to gut it out to make it to the top. 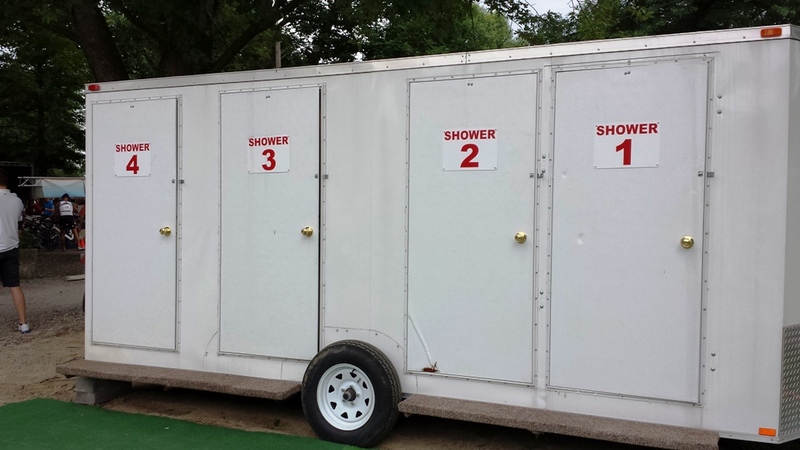 I never saw showers at a race before. Around mile 25 I came upon an ambulance which had one of our riders in a stretcher, there was a sharp right hand turn in the road and some guy crashed pretty badly and had to be taken to the hospital. Towards the end of the race, around mile 30, there was another ambulance that I saw pulling away from the scene of another crash. I have a Trek 4500 Mountain bike I used for this race with big knobby tires but the serious riders had tires no wider than my thumb. Even with my clunky type bike I managed to hit top speeds of 41 mph so I’m guessing the serious riders were going even faster. 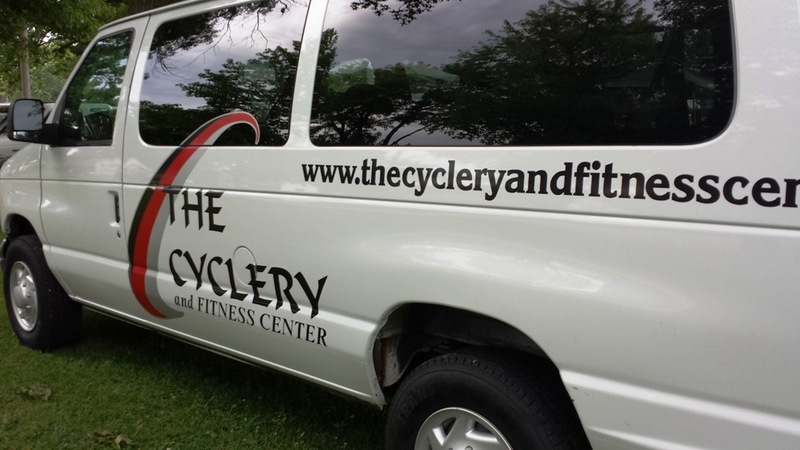 I saw the cyclery van a few times along the route and they helped out riders with flat tires and other mechanical issues. 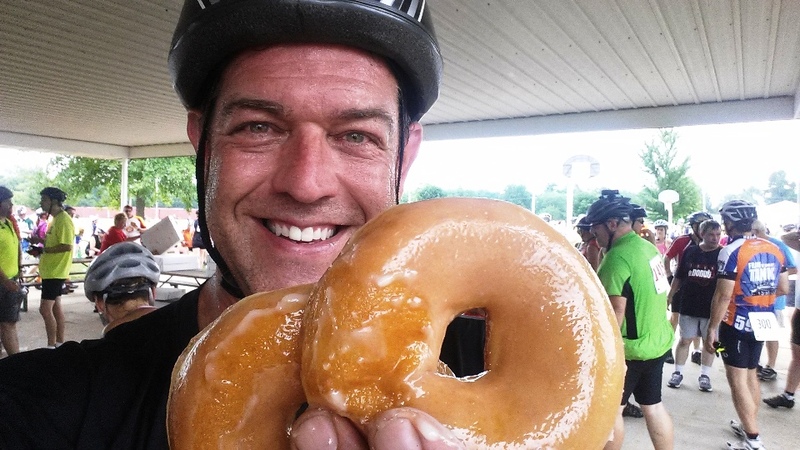 The first donut stop was in Mt Olive, Illinois and, at the time, I was thinking 8 miles is a pretty good distance for a race 🙂 I was feeling a little bit intimidated that there was another 16 miles to ride after that stop before the next donut stop. I ate 6 donuts at that stop and washed it down with a bottle of water. There was a very nice straight, stretch of road right after the first donut stop a little over 5 miles long. That was my fastest section in terms of average speed which was in the 18 mph range. The second donut stop was in the vicinity of Gilespie and Bneld Illinois. I had 3 donuts at the second stop and 6 bottles of water 🙂 I think any time I may have saved from eating the donuts was easily offset by how long I stopped. I probably spent a good 20 or 30 minutes at the second stop and I was much, much hotter than I was at my first stop. 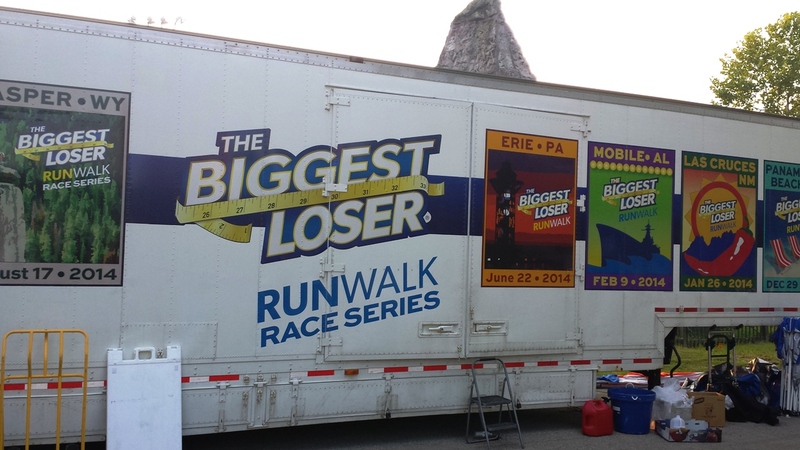 There were a total of 6,500 donuts available to be eaten at this race and a little over 2,000 bottles of water. The time adjusted winner of the Tour de Donut ate 26 donuts for a time adjusted race duration of 36 seconds! The winner for the most donuts eaten was 36! OMG! The ladies didn’t eat as much as the men and there was a tie for the most donuts eaten by a lady which was 12. I remember I was excited at the beginning of the race and a little more stoic between the first and second donut stops but, I got excited again during the last 2 or 3 miles of the race. I thought about my brother who loaned me a cushioned bike seat to put over my stock bike seat. Without that cushion rides of 10-15 miles end up impairing nerves in the groin region and there’s a lot of tingling & numbness down in areas where there simply should not be numbness! But, that extra seat cushion worked out great and totally alleviated that problem. As I got closer to the end, I thought about my parents and the fact that they came up to the Ozarks last weekend to surprise me for my birthday. I was feeling grateful. There are times during my races, this bike race as well as others, when I feel a bit like Forest Gump when he takes off and runs across the country for a few years. The points in the movie when he’s passing gorgeous scenery. There was some very nice scenery along this route and some very picturesque moments. According to my Sports Tracker I finished the race in 2 hours 45 minutes and I think the tracker paused when I was at my donut stops so that would have been actual riding time. I crossed the finish line at about 3h38min after the start of the race. 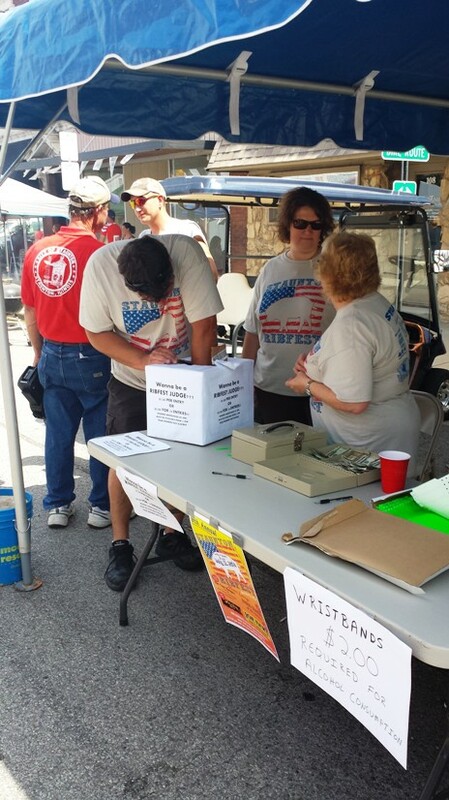 I spent most of my time in Staunton at the Rib Festival. I got myself a beer at one end of the festival and slowly worked my way to the other end. 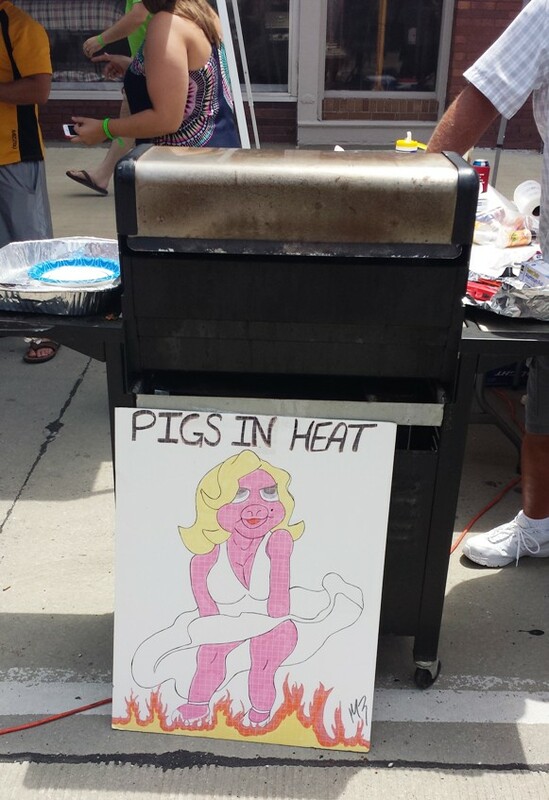 I learned the eating portion of the festival didn’t start until 5 p.m. so I had some time to kill. 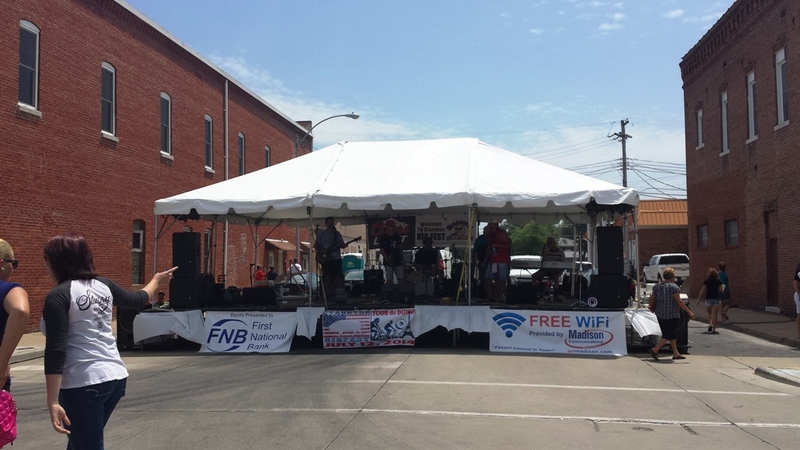 In the middle of the festival were a couple live bands which were pretty darned good. During sets there were a lot of people dancing in the middle of the street. At the opposite end of the festival I came across a bunch of bikers that had ridden in from Panama, Florida! That’s a heck of a long ride. 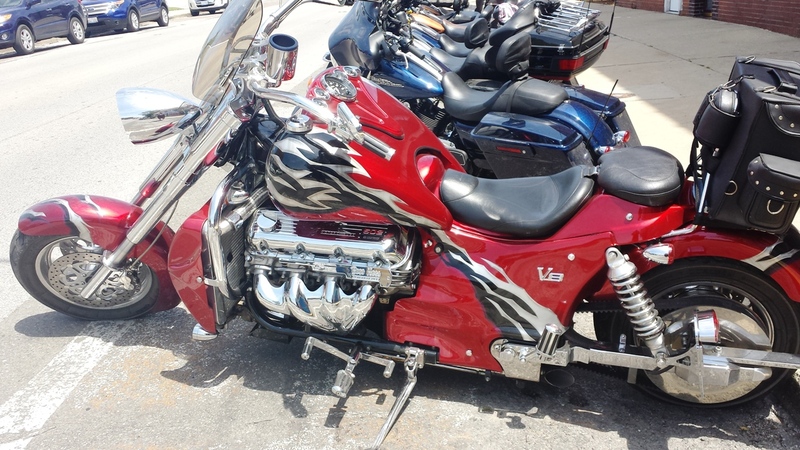 The bike pictured below has a 500 cubic inch V-8 engine! This was a really fun ride. A few years back, when I was still in school, I did some riding and learned my maximum riding limit was about 30 miles but, I ended up putting in a little sprint towards the end of this 35 mile race and could have easily kept going so I was pretty excited about that and feel much more confident about the 50 mile Half Century ride I have coming up in September. 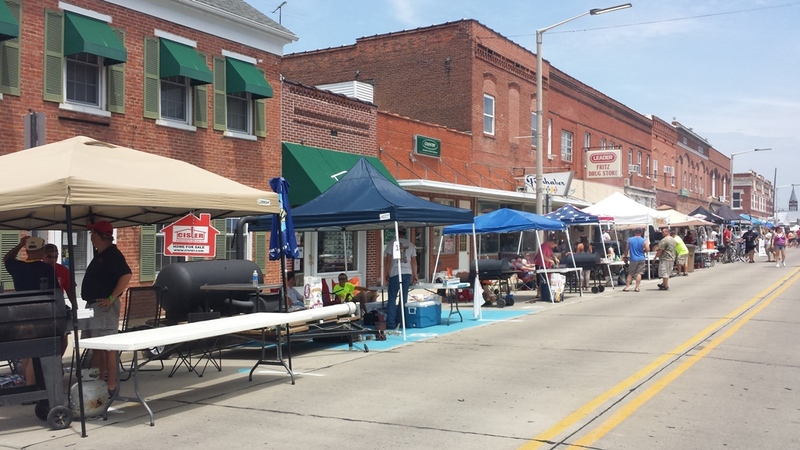 The Tour de Belleville is a fun, family friendly bike ride throughout the streets of Belleville, IL. 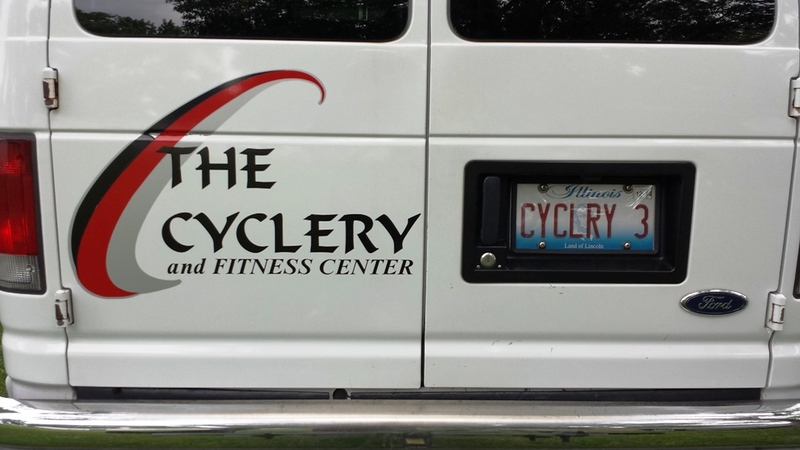 I had some work out in St Louis today and was surprised by the number of cars on the highway heading towards Belleville with bicycles attached to their cars. 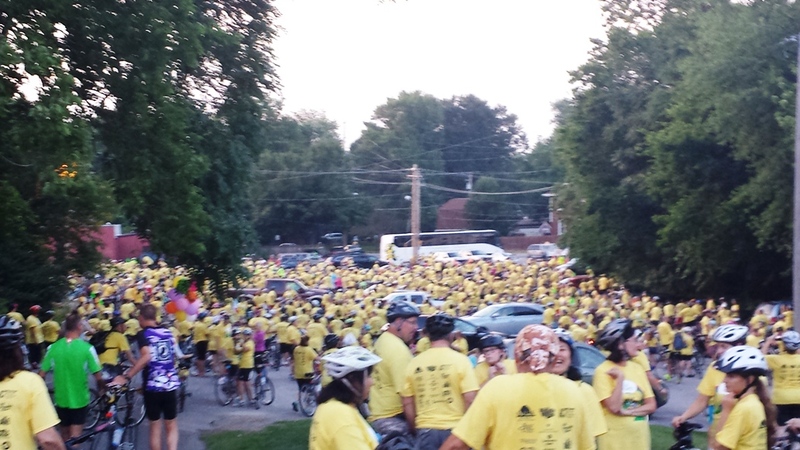 This event usually pulls in around 2,000 riders each year but, this year seemed a bit bigger than usual. 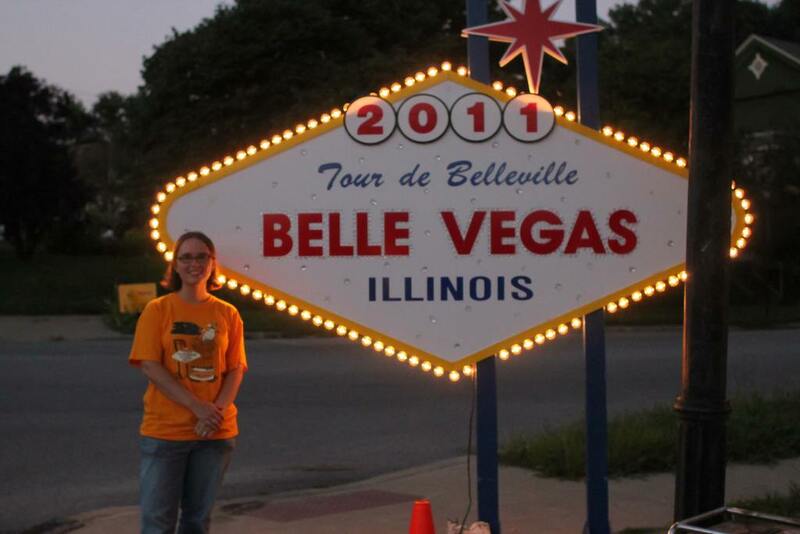 I liked the 2011 Theme of Belle Vegas and think that would be a pretty smart way to promote the city. I did manage to take a couple really nice, blurry pictures of the lower parking lot full of people waiting to start. And, wouldn’t you know it, when I got back to my car after the race there was a flyer on my car for an upcoming bike ride which included all those distances! Soooo….. I signed up for my first Half Century Bike ride scheduled for Saturday, September 6th called the D.A.R.E to Ride To The Lake! 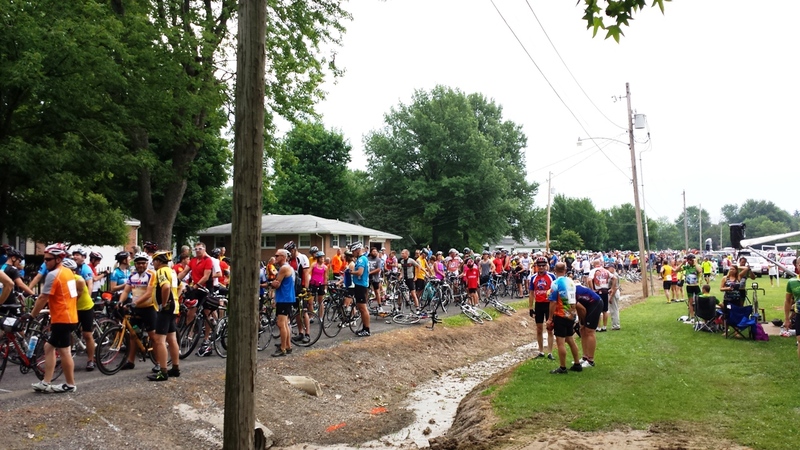 which is a bike ride from Trenton, Illinois to Carlyle Lake Illinois and Back. I’ve also noticed that bike rides are a lot cheaper than running type races. The Tour de Belleville is only $16 bucks a rider and they even have special price breaks for families so it’s even cheaper. 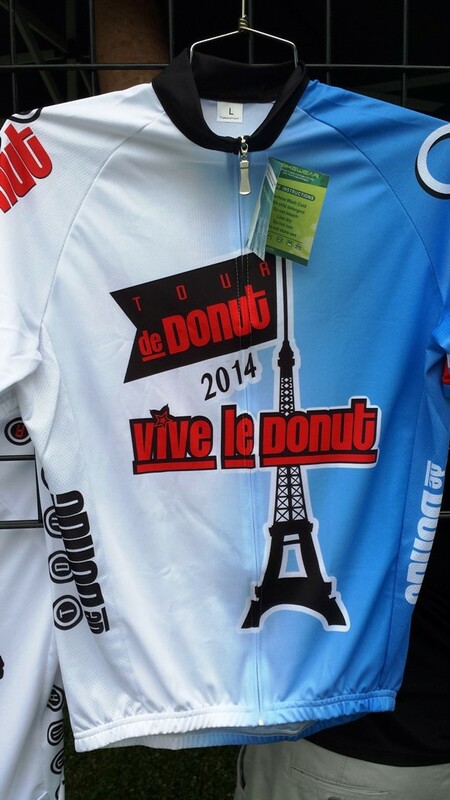 I don’t recall how much the Tour de Donut is tomorrow – and NOW I’m REALLY Looking forward to that race! 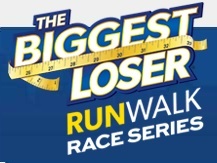 For this race on Sept 6th – any distance is only $20 and they have 5 distances to choose from; in miles they have an 11, 25, 50, 62 and 100.
hmmmm….. 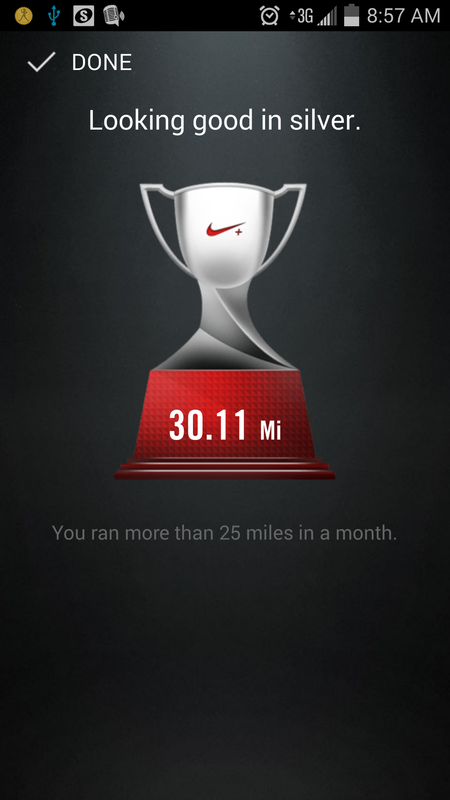 I checked my stats on Sports Tracker comparing last years bike ride to this one. Last year I did the 15 mile route and averages 12.3 mph. 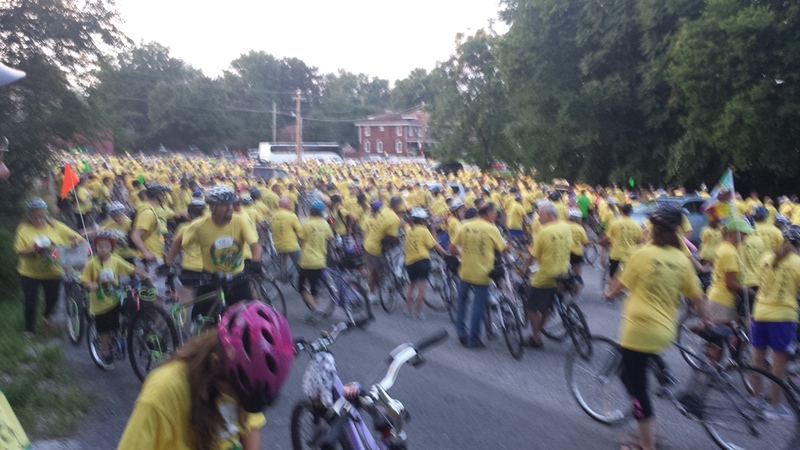 This year I did the 5 mile route and averaged 12.4 mph…..
One cool thing about starting at the South end of the parking lot instead of the East end is that I actually finished my ride so quickly that when I got back, there were still a couple hundred people waiting to start! I’m pretty certain I’ll do this run again (can’t beat the price & fun combo) but, I don’t think I’ll be taking those first two right turns – only miss out on about 1/8th of a mile but easily save an hour of time. I AM looking forward to eating some donuts tomorrow! 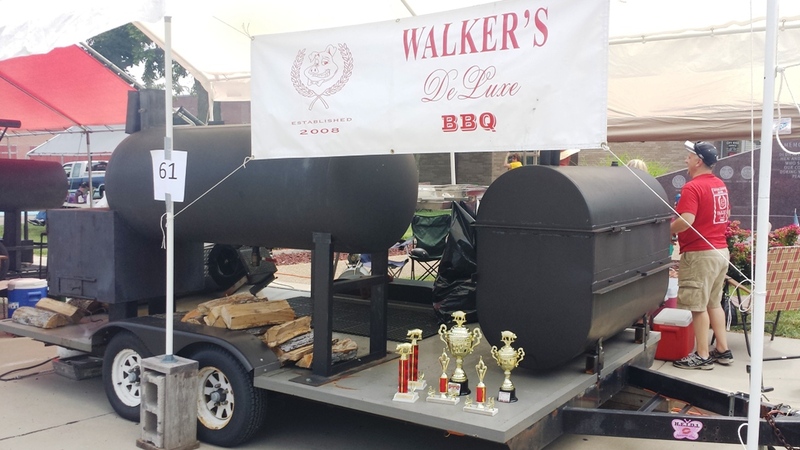 🙂 There’s supposed to be a Rib Fest in Staunton tomorrow after the race and I’m looking forward to eating some ribs as well 🙂 Which reminds me – I weighed 262 this past Thursday but haven’t gotten that blog in yet. For those of you keeping score, that’s a 10 pound gain since the week before …yawn & ho-hum. No biggie. yikes – just realized I’m sitting out here in my garage with the door open and I’m wearing a biking helmet – my new neighbor that just moved in is going to think I’m a kook. 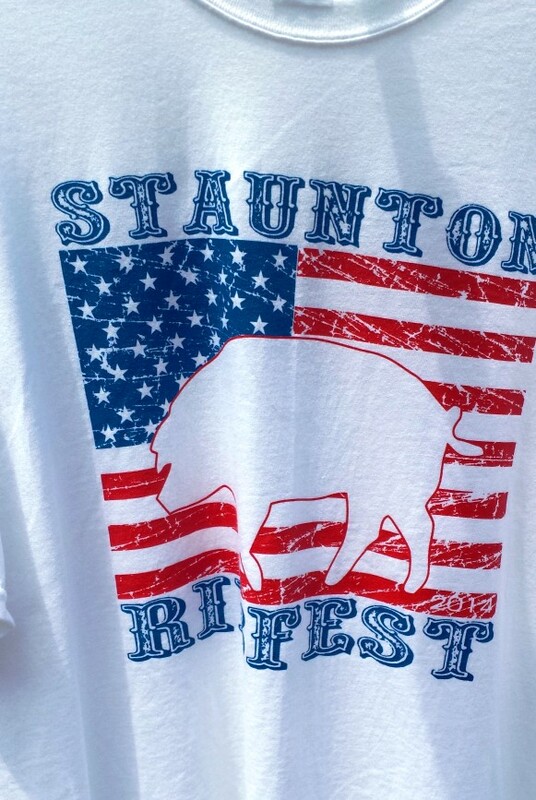 I’ve never actually been to Staunton, Illinois …Looks like it’s 42 miles away from me. This is cool – they actually allow you to camp at the city park where the race begins the night before the race for free. 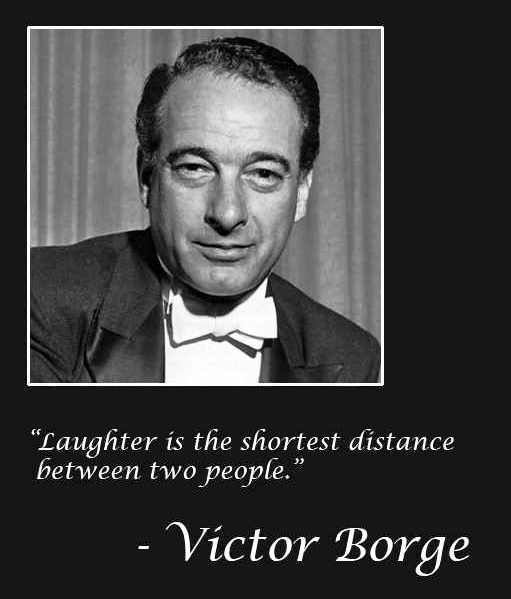 Many years ago I had the privilege of seeing comedian and piano virtuoso Victor Borge perform at the Fox theatre in St Louis, MO. It must have been a very good show because, like my first marathon, it left many indelible marks on my memory. 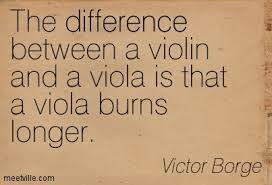 One thing I recalled reading about Victor was that if he didn’t practice for a day then he could tell a difference. If he didn’t practice for a week then his wife could tell a difference and if he didn’t practice for a month then his audience could tell a difference. The next testing will put me at the rank of Ni-Kyu or 2nd degree brown. When a belt rank is under black then the numbers go backwards on their way to black belt so I’ll only have Ichi-Kyu or 1st degree brown left before I test for my black belt. For Ni-Kyu testing I’ll need to perform 9 of the 10 basic katas we have in our style, for Ich-Kyu I’ll be doing all 10 and for black belt, we do more katas then are required for any other rank in the style, all 10 basic katas and two black belt or fighting katas known as Ananku and Wankan. Last Thursday sensei left early after watching three different katas then I got to stay and work one on one with the remaining black belt and worked through all 12 katas I’ll need for black belt. Thursday my punches were fast, clean, crisp and focused – kind of like being hit with a bullet. During my post vacation workout on Tuesday my punches would have been more like getting hit with a sledgehammer and lacked some of the explosive pop from my previous workout. Still, getting tagged for my next rank was a great thing and formally adding in my karate practice came at a perfect time to help make this next promotion possible. Karate workouts are a bit different when people are slated for testing and tend to be more geared towards perfecting our katas which I like a lot. I had a weekend long run of 7 miles while in the Ozarks of Missouri and that is a very, very hilly part of the country. 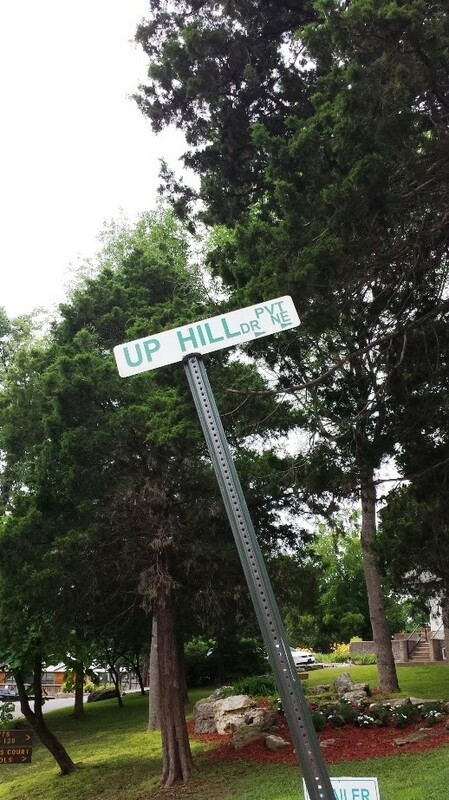 One road was so steep it was even named “Up Hill Drive” I pretty much got fried during that workout and it took about 2 hours & 4 minutes to complete. 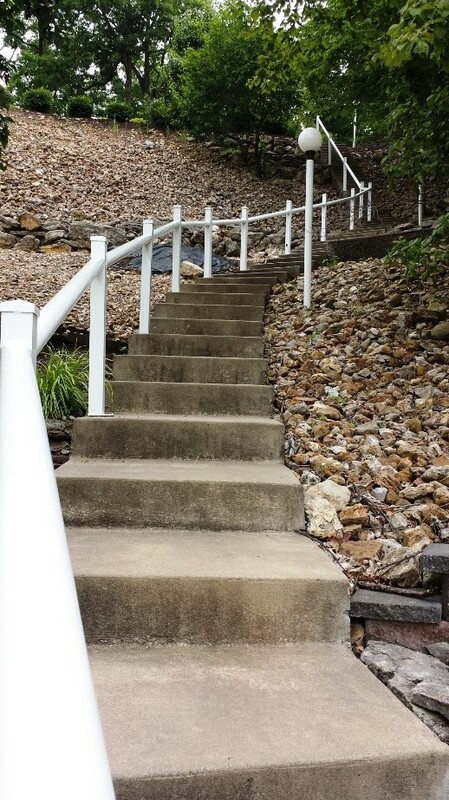 The stairs pictured below were encountered many times during my 2 hour adventure run. 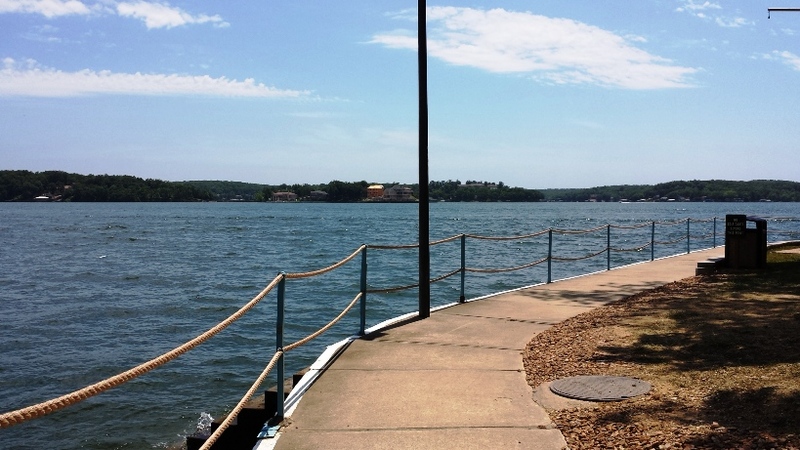 I wanted to avoid doing my Week 14, Day 1 run at the Ozarks because of those hills but, my brother suggested just staying on the complex and running back and forth along the waterfront to avoid as many hills as possible. Running along the edge of the lake reminded me of a Rock n Roll 1/2 marathon I did in Virginia Beach were the last mile or two of the race was along the boardwalk with the atlantic ocean to our left. I sort of forgot about all the sunlight that gets reflected from the water and could feel my face burning towards the end of the run. Fortunately, it was only a 3 mile run. My Day 2 Week 14 run later on today will be a 5-miler followed by a 3 mile run tomorrow. 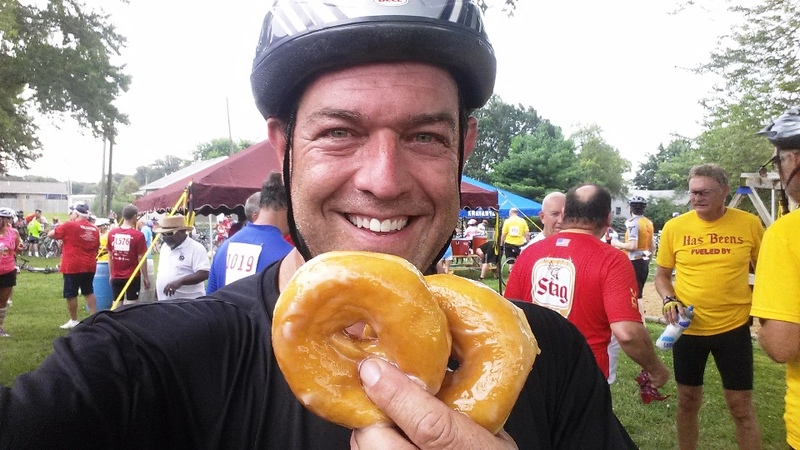 This Saturday’s Day 4 run of Week 14 is an 8 mile run which will be replaced by a 9 a.m. Tour de Donut 34 mile bike ride out in Staunton, Illinois. I was reading in one of the running websites about cross training and it recommended riding a bike for about 1.5 times as long as your projected run if you are going to replace one for the other. So, I figured the 8 miles would take about 2 hours and I was looking at about 3+ hours for the bike ride so it should be a good replacement. 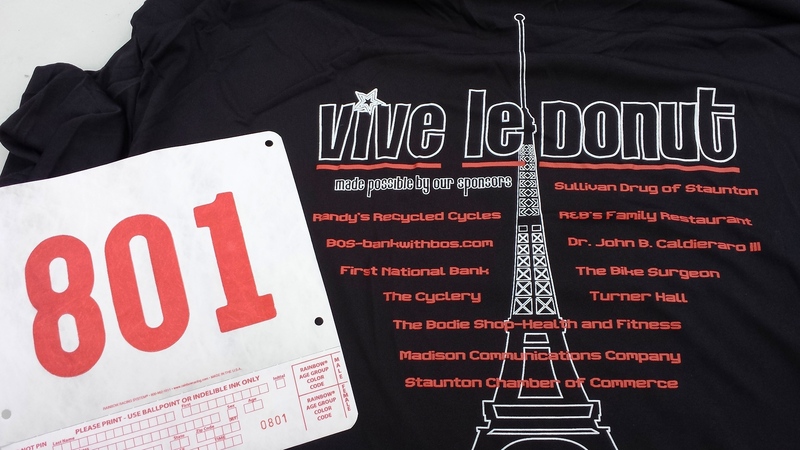 Friday night will be a short 5 mile bike ride in a local Tour de Belleville. There’s also a 15 mile option in this 9th annual ride but I don’t want to do too much before my 34 mile bike ride just 12 hours later. A few years back I found that 30 miles was about my limit on the bike which … I found a little disturbing. The personal bias in my head was such that I liked to think I could go out and ride 112 miles on my bike because that is the distance a person needs to ride their bike in a full triathlon. But …the humbling reality was that 30 miles was about my limit before my legs turned to noodles. So, this weekends 34 mile ride should be a good challenge. I’m hoping all the training I’ve done up to this point will enable me to eek out those extra 4 miles and maybe even finish strong. 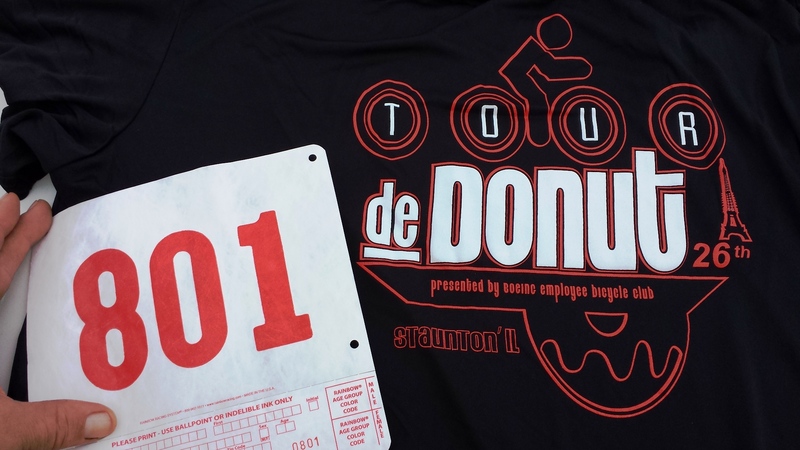 This will be my first Tour de Donut and my 4th or 5th Tour de Belleville. I like the idea of having annual traditions.